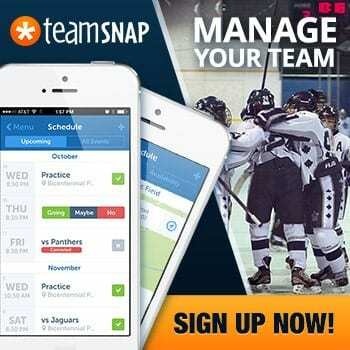 Scoring is an integral part of the game of hockey. Players that score are highly coveted at any level of play. So how do we give ourselves the best opportunity to score consistently? 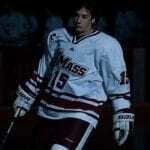 As a player at the Division One level I didn’t score many goals. Since my playing days ended, I’ve studied the “art of scoring” relentlessly. Thanks to NHL.com we have access to every goal scored at the highest level. We’ve studied how the best score in the NHL and below have highlighted 5 actionable habits to help you score more goals. These habits aren’t in any specific order of importance. 1. Simply go to the net. When the puck is at the point, position yourself to screen the goalie or set up backdoor for a tap in. Having a nose for the net takes a lot of guts and the willingness to get knocked around a bit. 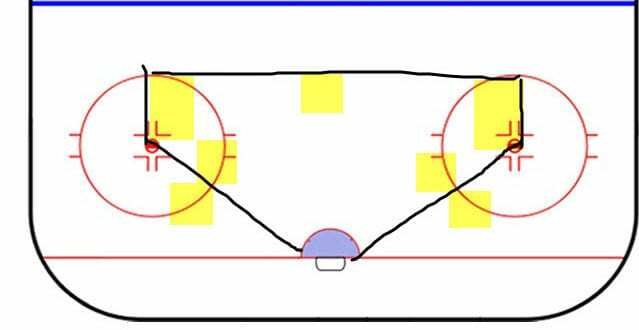 If you can battle for position inside the house, which is the area where most of the goals are scored, you’ll find yourself getting rebound goals, tipping pucks and sometimes having shots go off you and in (I could have used a few of these in my day). 2. Find soft spots. Within the area we call the house there are a few “soft spots” we can position ourselves to support our teammates, receive passes and still be in a dangerous scoring position. See positions identified below. 4. Shoot in stride and through screens. Shooting in stride is one of the best ways to disguise your release, combine this with shooting through a screen and you’re going to find yourself scoring in bunches. 5. 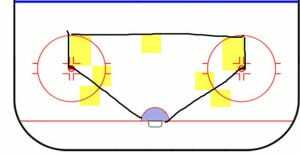 Find ways to carry the puck inside the house on a more consistent bases. This will lead to more chances for yourself and your teammates. Puck protection, being physical with the puck to create space, tight turns and stop turns are all skills needed to maneuver your way in the house. Shoot 200 pucks a day. It takes good mechanics, time and sweat to building up your shot. Scoring is fun! Work hard to give yourself the best chance to score more goals to help your team win games! HOMEWORK: Go to the http://video.nhl.com/videocenter/ and pick a player, watch 20 of their goals, take notes on how they score. If they’re scoring this way at the NHL level, you’ll be able to translate their success into success at your level of play. Now it’s your turn, what other habits help players score more consistently? 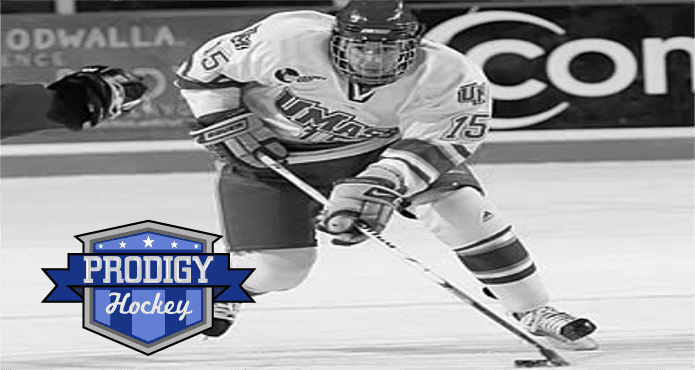 Brian Keane is the founder of Prodigy-hockey.com. 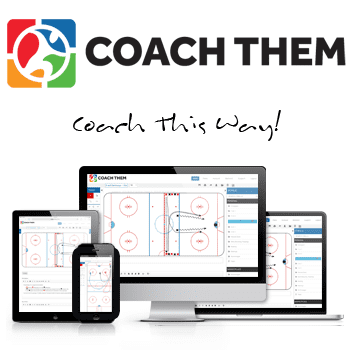 He created his site to help educate players, coaches and parents on the great game of hockey! Through this online portal he hopes to give players and coaches access to high end skill development drills and strategy. 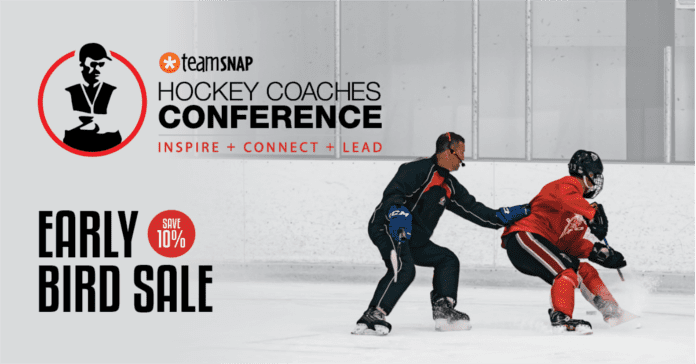 By studying today’s brightest hockey minds and instructors Brian aims to provide his students the best information possible to make them better players! Brian has a true passion for the game of hockey and is driven to help develop hockey players of all ages and skill levels.